The Cold War Part Deux? Most of the time NCIS investigates terror threats from either Islamic or Homegrown Extremists, but they aren't the only groups that pose a danger. 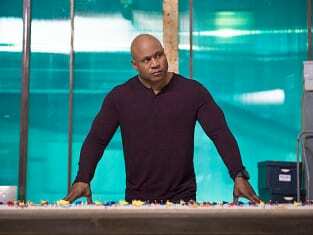 On NCIS: Los Angeles Season 5 Episode 8, it was an old nemesis that emerged as the culprit behind the theft of highly sensitive information that threatened the country: Russia. As the terrorists become more sophisticated, so does the use of technology to try and prevent attacks before they happen. A major deterrent and preventative measure has been the deployment of nuclear detection devices throughout the country, especially in major cities like Los Angeles. When thieves stole the data which provided the locations of those detection sites, NCIS went into high gear to get that information back and presumably stop a bombing. 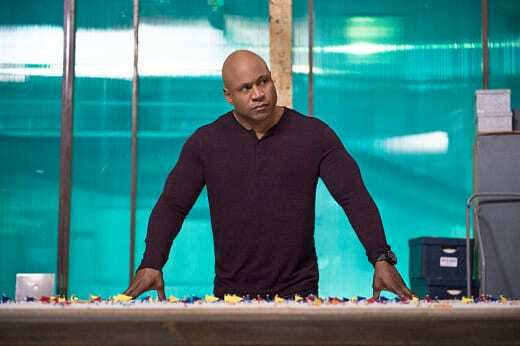 The NCIS: LA team went through a investigative maze which led them from person to person with no real clue who was behind the theft. The first half of the "Fallout" was a tad exhaustive to watch. The team wasn't making any real progress and their attempt to track people wasn't all that exciting. Plus, the investigation didn't seem to be going anywhere. The team dynamic and occasional jokes were all that held my interest. One of my favorite Deeks' lines ever, "I'd rather kiss the Outbreak monkey than use a payphone." Seriously, where does he come up with this stuff? When the nuclear detector went off it was game on. The perpetrator made a mistake by showing their hand by testing the system. The thought that there was a bomb in the park was quickly discounted and they realized someone was testing their response to a positive nuclear alarm. The resulting capture of Kelvin Griffin was problematic for Hetty. At least, Sam and Callen's near-death by train was worth it, as Griffin was able to provide the missing link regarding who was behind the theft. Though, the answer was not one that helped Hetty's case at all. With the critical data in the hands of the Russians, the team decided to go rogue to get the information back. They had to protect Hetty, but also wanted to keep LA County safe. It may not have been an ideal situation, but despite the risks to their careers and freedom they knew what had to be done. Props to them for doing the "right" thing, even if it wasn't necessarily legal. In an odd way, these off-the-book missions just bring the team even closer together. They have a common goal and have to rely on each other without a doubt to get it done. The plan to get in and out of the Russian consulate's place without detection didn't exactly go as planned, but it was a success. It's a good thing they had an good exit strategy planned just in case things went awry. The highlight of the hour had to be watching Callen and Sam do a blind fall out of the upper level windows to land on the back of the "shuttle." Confidence in their partners. And, the ultimate trust fall. Even though, they successfully retrieved the stolen data from the Russians and protected Hetty's job, it wasn't without the wrath of Granger. Though, really, what did he expect? It's not like this is the first time they have disobeyed him. Granger's warning, "If any of you pull something like this again...." cracked me up. It's not the first time they went rogue. Remember, Romania? And, it most certainly won't be the last. Poor Granger. He'll never learn, will he?